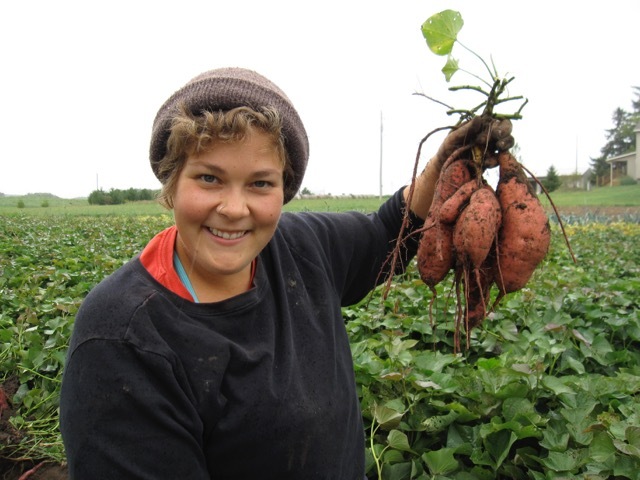 Here is what the 2011 and 2012 farm intern, Chef Kari, has to say about her experience at Orange Cat Community Farm. Two years of interning at Orange Cat Community Farm (OCCF) has been integral to my development as a young professional chef. I joined the intern program at OCCF with a simple thought in mind, “I want to learn to grow food.” This idea would later become the basis of how I identify the speciality of my craft; using seasonal, local, organic ingredients became a key component to my cooking. 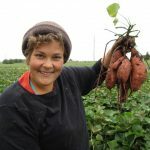 When I began farming with Laura, I was nieve about how much work went into growing vegetables. Farming strengthened my character and taught me lessons such as patience, stamina, and stick to it iveness. I’ve learned how to farm vegetables and also to insert my self, skills, and passion of cooking into the conversation of the good food movement. Farming is experiential and is best learned through doing. Laura is incredibly generous with her knowledge and through her experiences will teach you more than you can bargain for. OCCF is an incredible place with fertile ground to grow vegetables and your own personal developments. My journey led me to OCCF after moving home from college. I had been living in Northern California, where I attained a degree from Humboldt State University in Religious Studies. Shortly after graduation, I attended a small culinary school and became certified as a gourmet raw food chef. I had qualifying degrees with little experience and know how about competitively marketing my skills. Farming gave me the time to learn a new skill while also enough freedom to develop my personal interests. Having access to so much high quality produce gave me an opportunity to play and develop a niche. Over the course of my two years at OCCF I networked and marketed myself through our CSA members and began teaching classes on raw food cuisine. Using our produce, I taught several classes in a variety of venues to people looking to integrate more fresh, raw eating into their diet. This proved to be very successful and gave me the confidence to acknowledge and expand my talents. There are limitless boundaries of how this experience may affect your life and manifest itself. I’ve learned how the combination of seeds, dirt, water, sun and nurturance can lead to things like healthy bodies and culinary divinity. You will learn a variety of skills like how start plants from seed, irrigation, cultivation through various weeding techniques, pest control, produce handling and direct marketing. Not to mention the wealth of information regarding preservation techniques and learning to eat seasonally throughout the winter months. Laura is an excellent young business woman and you will learn a lot by closely working with her. She also offers a fair paid wage, comfortable intern housing, and more produce than you’ll ever need. Laura’s internship program was the perfect jumping off point for a young person like myself, exiting college and joining the world with a need for direction. I would not be who I am today if not for this incredible opportunity and experiences.